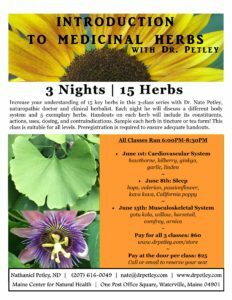 Increase your understanding of 15 key herbs in this 3-class series with Dr. Nate Petley, naturopathic doctor and clinical herbalist. Each night he will discuss a different body system and 5 exemplary herbs. Handouts on each herb will include its constituents, actions, uses, dosing, and contraindications. Sample each herb in tincture or tea form! This class is suitable for all levels. Preregistration is required to ensure adequate handouts. Register online (CLICK HERE). You may also call or email to reserve your seat if you plan to pay at the door.